Pests are animals that have been introduced to Australia and cause problems for native animals and the natural surroundings. They are a significant management issue for the environment. Why and how are these animals brought into Australia, and how have they negatively affected the landscape? 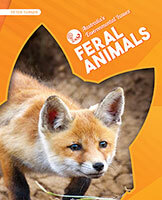 Feral Animals explores the problem of introduced species, as well as explaining how some animals have become serious pests and what is being done to control it.